Party Poker is one of the elite online poker rooms available, offering quality promotions, good game variety and excellent customer support on a fast, reliable software platform. Though they have lost their status as the largest online poker room on the Internet, which occurred when they stopped accepting US players due to recent changes in US legislation, Party Poker still houses an exceptionally large player base. Good promotions and an esteemed tournament schedule encourage their members, new and old, to return for more. New players are encouraged to try out the free play poker until they feel they've become accustomed to the games before moving on to play for real money. 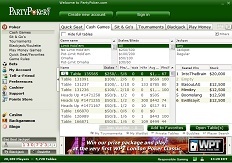 InternetPoker.com Players are offered two unique Party Poker Bonus Codes. In order to get the $25 free cash, you must make a deposit of $50 or more and play a small amount of hands. Also, new players who sign up a real money account are invited to join in the daily $100 Rookie Freerolls. New players will have this option for the first 30 days of account activation. Registration is not automatic for the Rookie Freerolls or the New Player Lucky Dollar tournaments, so don't forget to register. A nice variety of games can be found at Party Poker including Texas Hold'Em, Omaha, Omaha Hi-Lo, Seven Card Stud and Seven Card Stud Hi-Lo, all available in Fixed Limit, No Limit and Pot Limit. Short-handed, full table and heads up action can be found in all varieties of games. With such a high player traffic volume, players find ongoing action in every game type. No Limit and Pot Limit stakes range from as low as $0.02/$0.04 to $25/$50, while Limit games start at $0.05/$0.10 scaling up to $100/$200. 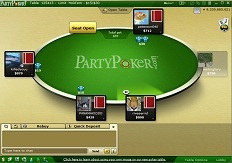 Party Poker became independent internet poker site in October of 2005, allowing them to play at their own independent tables instead of sharing their player base with 4 other sites.Party Poker has upgraded their software several times throughout the last few years. Updates this last year included a simple and easy to follow poker room navigation system. Graphics have improved significantly, and playability is more than decent allowing more than 100,000 online poker players to play simultaneously. Players to the flop percentages and the hands played per hour have also been included in recent updates along with the already existent ability to look at the average pot size for the past 20 hands, make player notes and have instant hand history. Players may select from a wide variety of deposit/withdraw options, including credit cards. However, Party Poker reminds players that certain credit card companies may decline fund transfers to/from online gambling operations, therefore if a credit card transaction is denied, this may be the cause. In this case, Party Poker recommends choosing any of the other payment methods available. Party Poker Deposit Methods: Visa, MasterCard, Diners Club, Visa Electron, Maestro, Switch, Solo, PaySafeCard, EPS, WebMoney, MisterCash, iDeal, Laser, Click&Buy, Click2Pay, GiroPay, Ukash, eWire, ELV, Electronic Transfer, UseMyBank, BPAY, MoneyBookers, EntroPay, NETeller, Citadel, MyCitadel, Bank Transfer and Bank Wire. Party Poker Withdrawal Methods: Visa, Maestro, Switch, Solo, Electronic Transfer, WebMoney, NETeller, Click2Pay, BPAY, MoneyBookers, Bank Wire, PayPal, Check by Mail and Check by Courier (FedEx, DHL and UPS). Customer support is offered 24/7 by telephone and e-mail. The support staff is very knowledgeable in all facets of the online poker room, including promotions, account, technical difficulties, etc. Telephone support is extremely fast, providing resolutions in typically less than a minute. E-mail support is very reliable, but doesn't match up to the speed of phone support. InternetPoker.com offers an exclusive Party bonus for new players. 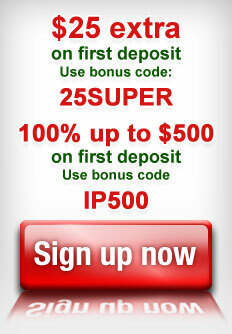 Choose from $25 free instantly credited to your account or the 100% match offer. Must use the bonus codes on this page.